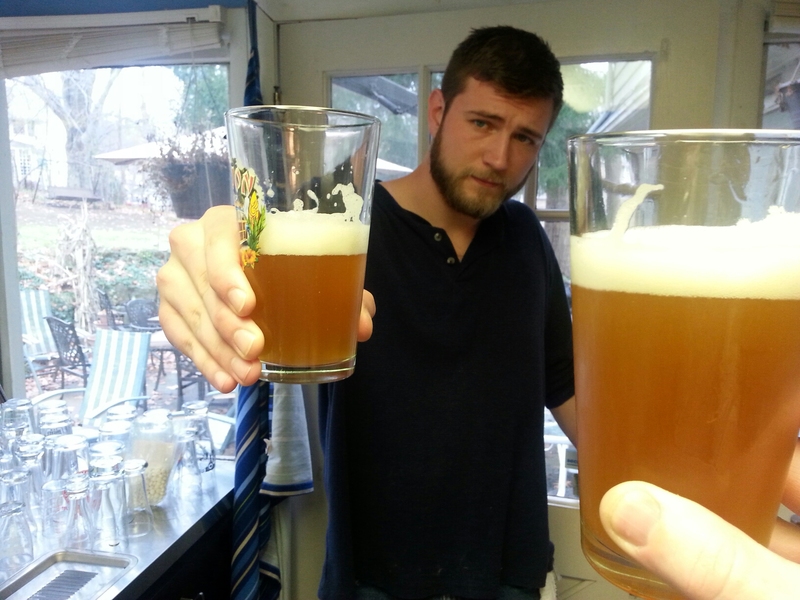 With little pomp and circumstance, we brewed the last pilot batch of beer at the home brewery this past weekend. To be truthful, it snuck up on me – it’s been a busy time of year with kid’s stuff, more kid’s stuff, brewing beer and getting the brewery built-out. I sent out brewing invitations last minute as it completely slipped my mind. I was going over the calendar with Jesse on when to brew next after this and with Christmas coming up, there will be little time after these recently brewed beers come out of the fermentors to filter and keg. May as well start making the transition to the new place right? 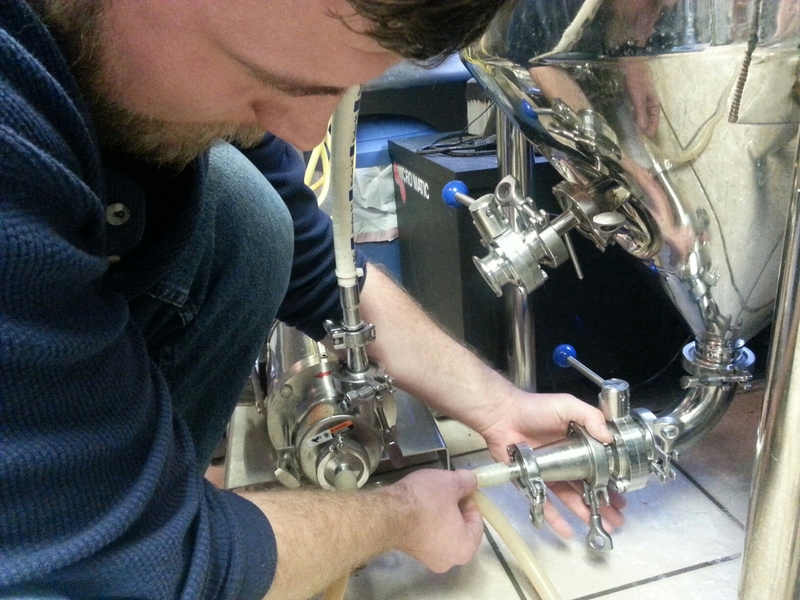 Later this month we should be able to keep brewing on the pilot system at the brewery. By that time, it will be completed enough and we may even have a draft beer system ready. *Though even brewing at the brewery now going forward before the opening, this stuff will not be and cannot be for sale. It will still be for testing/development for friends and family and personal consumption. The Feds and State have strict guidelines. All beer to be sold has to be brewed AFTER licensing gets approved on both the Federal and State level. Whatever beer I have left when licensing gets approved will go back home to my draft system as I can’t sell it. **This also means that the first month will be a ‘soft launch’ were I won’t even be open the first two weeks as the first few batches of beers will be fermenting. Beginning week three I will have a soft launch as I should have 3-4 beers on tap. It will take a full 4-6 weeks to completely have all the taps (10-12) filled. Then I will have the official opening, and later, the grand opening. So this past weekend we did the Amber and a Pale Ale – these will be among the ‘house beers’ at the brewery….beers that are on tap all-the-time. These are one of the oldest recipes and have been tweaked over the last several years. The amber has gotten perfect with a great balance of specialty malts…and it’s amber! The pale ale I am still experimenting with different hops though the base recipe is solid. 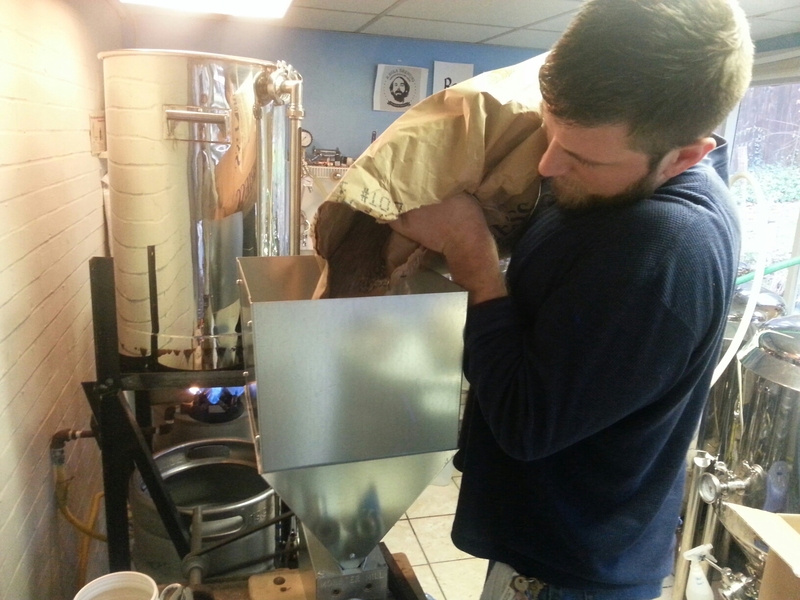 Jesse starting on the grain milling. We used nearly a 50lb bag of pale ale malt for both of these. 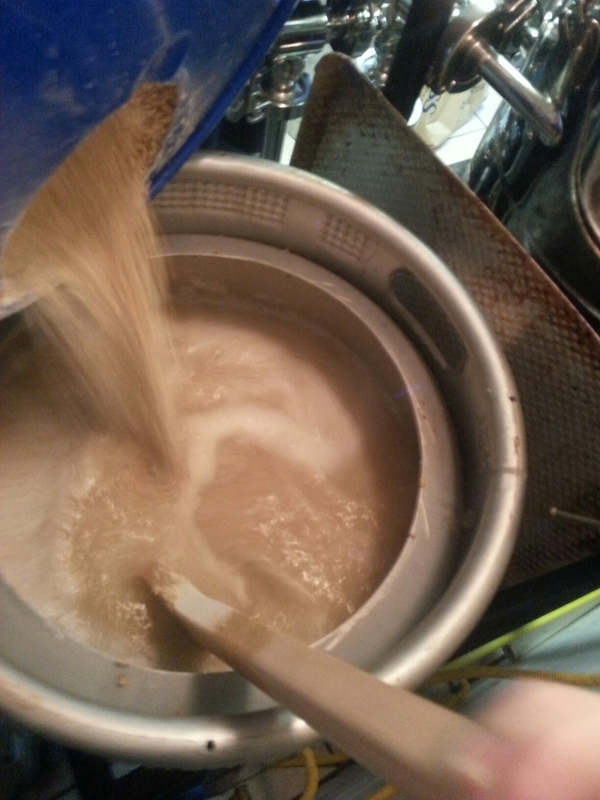 Mash-in! Adding the crushed grains to the hot water. 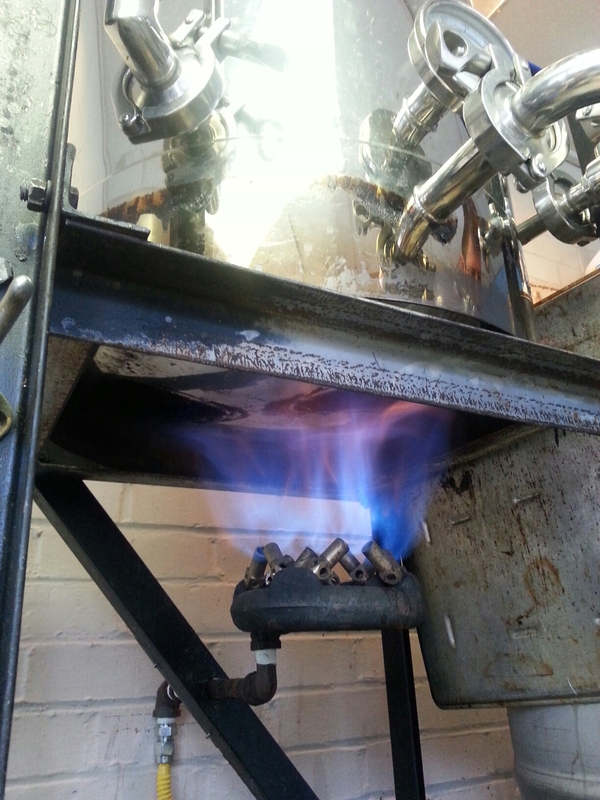 Stirring the mash every so often to keep the temperature more even as these are not jacketed tanks. Always an awesome site and sound…keeps us warm in the winter though today was a 60 degree day – it got hot, fast. 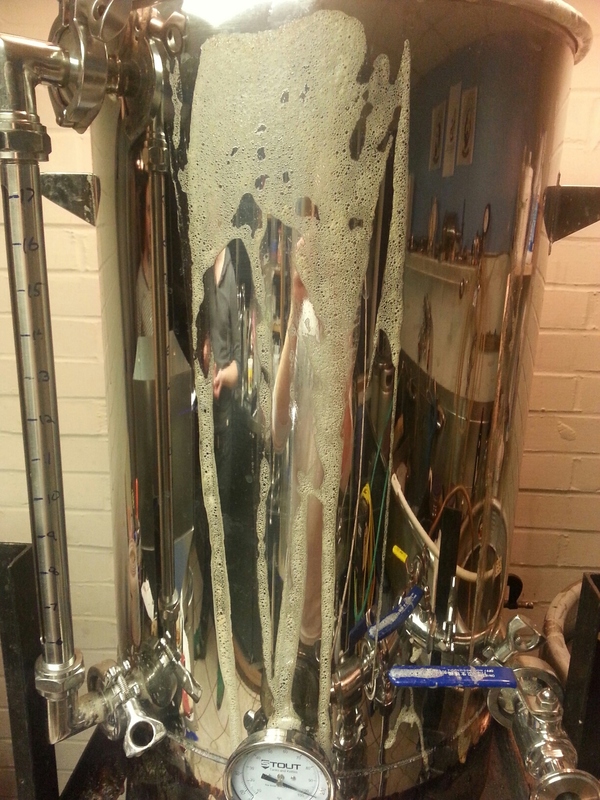 Boilover before the hop addition. Grrrr….smells great though. Daniel and Tony sampling the Christmas on tap. Daniel with the final hop addition. 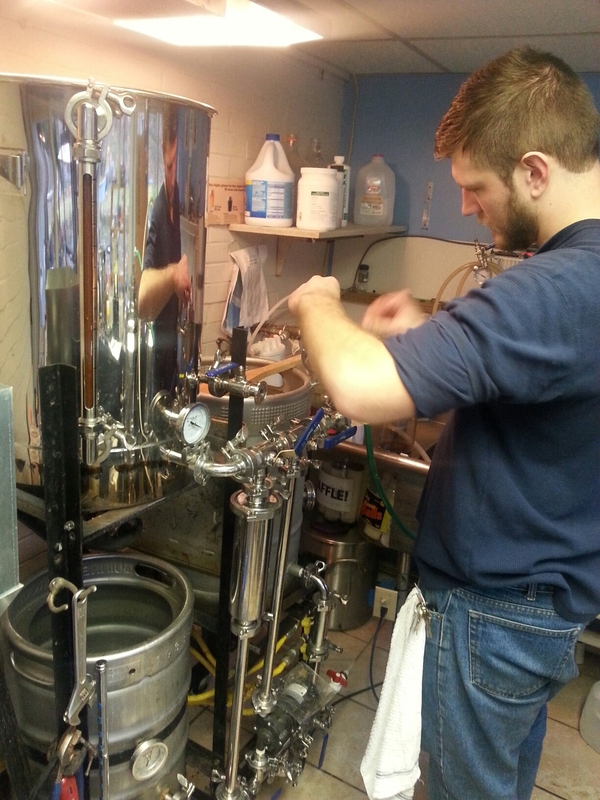 Final fermentor preparations for pumpout. Jesse’s thinking…”long day”. 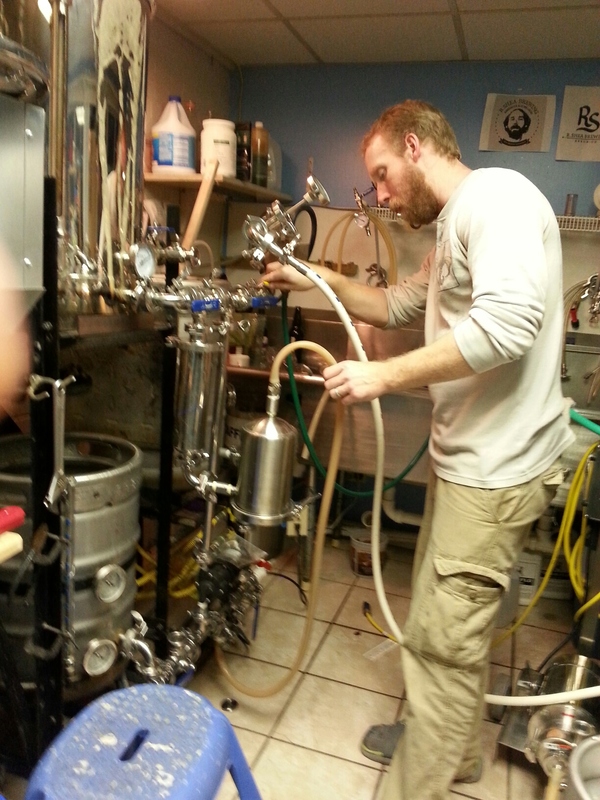 Pumping out to the fermentor. 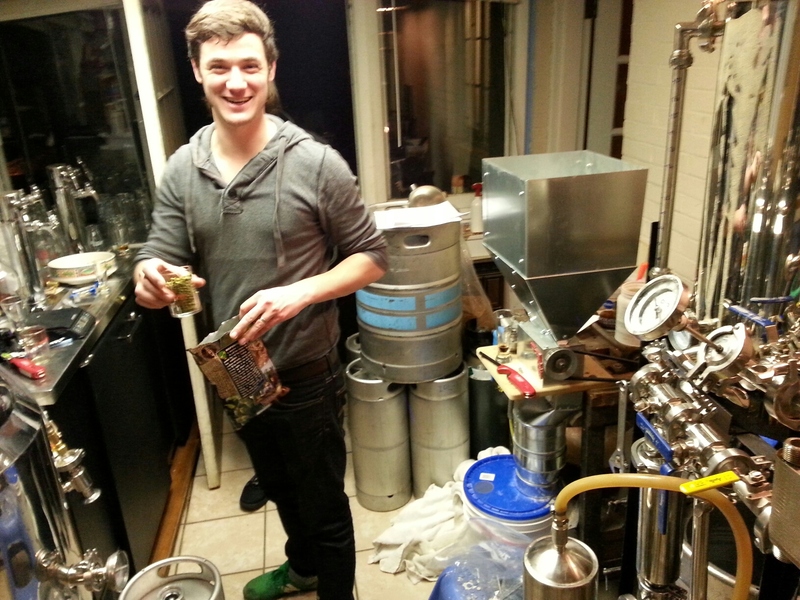 Myself on the pumpout of the pale ale using the Hop Rocket with some Simcoe whole hops. Thanks to Daniel and Tony (Jen too) who showed up on short notice – your critique of the latest Christmas was great (note: don’t change a thing!). The evaluation of the caramel-espresso stout as it ages was good too. 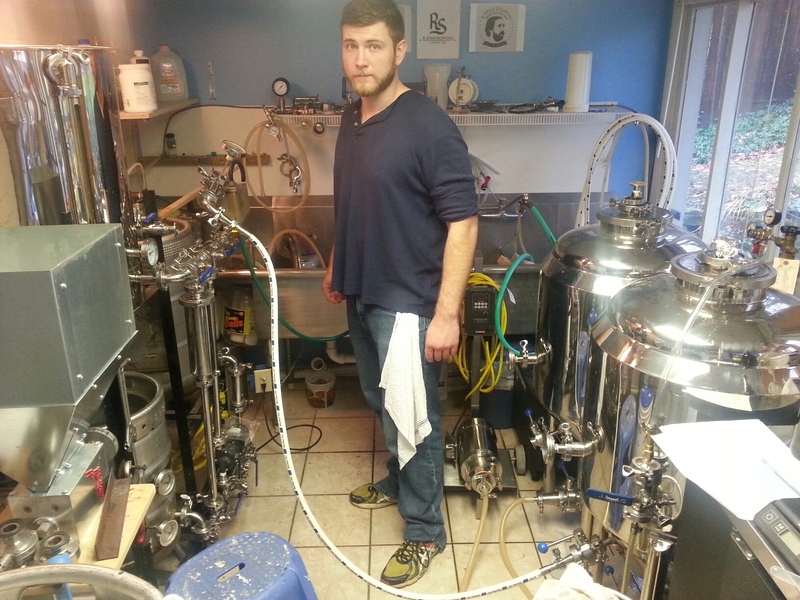 Thanks to Jesse, assistant brewmaster, for all of the help and evaluations. Next time we brew, it will be at the brewery! Cheers to progress! This is an experimental bottle conditioned Session IPA. Cheers! 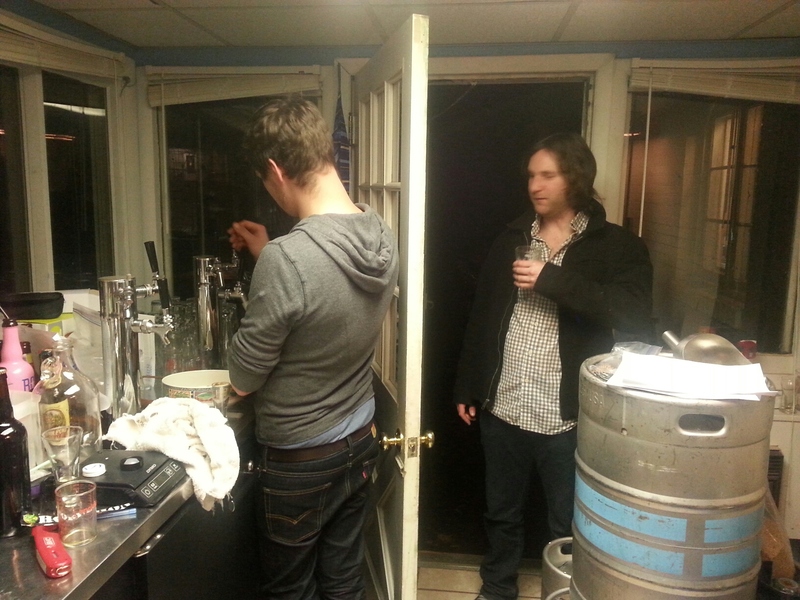 Ah the “humble beginnings” of a master brewer. I wish I could have made it for the final brewing at your home. 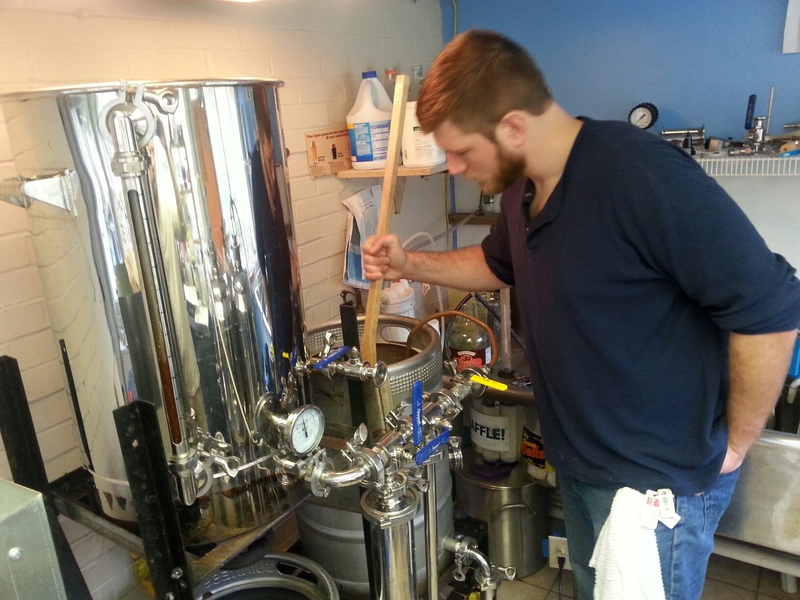 Looking forward to seeing the brewing at R. Shea Brewing!